I decided to try something different for my birthday dinner this year. 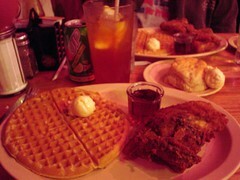 After catching Idiocracy at the ArcLight, we headed over to Roscoe's. Yep, THE House of Chicken 'n Waffles. I've wanted to eat there for a long time and figured gettting older was a good excuse to try it. Roscoe's did not disappoint. The Hollywood location is small and cozy with an eclectic mix of diners. Tourists and locals of many races and nationalities filled the place. The fried chicken was delicious, like my mama used to make it when I was a kid in the South. The syrupy waffle was perfect as a side dish. I also had a biscuit, which was big and fluffy. It was music to my ears when the server asked if I wanted my iced tea "sweet or unsweet." That's not something you normally hear north of the Mason-Dixon Line or west of the Mississippi. (I ordered it sweet). It was a treat to indulge in such yummy comfort food. I'll have to see how it affects tomorrow's weigh-in. Whatever the result, it was worth it. oh, that right there is a carb addict's dream come true. i might add nutella to the waffle instead of syrup though, to get my chocolate fix in there! oh, and happy belated birthday by the way!!!!!!! Glad you enjoyed it :) Sweet tea...still can't figure out why they don't have that up north..drives me crazy. I want that for all my birthdays. And Happy 36th! That was my favorite age till the current one. Your birthday was close to mine. I am so behind on my blog reading. Sad sad little person that I am.